This page offers information about courses, workshop dates and other bits of news and information. Questions or comments? Please contact me! Moving is hard. On body, mind, spirit and business! Moving is also awesome, though, because it allows an opening into a space previously unoccupied. To merge the Moving is Hard on Business with helping others Open to New Space, I am currently offering a 2 for 1 deal on Bowen treatments. Here, in Coffs, and also at Alchemy in Bellingen. Some conditions apply which you can read about on the Bowen page. Offer good through 12 October. Book your appointment(s) on 0426 241 435. Help me settle in and let me help you feel better. whole-hearted living workshops on in mudgee! balancing act therapies, in conjunction with youtopia life coaching, is pleased to announce dates for our next interactive workshop series. Beginning 29 April 2014, you are invited to come on a journey of 7 workshops/playshops over a 7 week period. The basis of these interactive workshops is whole-hearted living. Interested? Download the flyer. For more information, and to book, please phone me on 0426 241 435 or send me an email. What's happening at balancing act therapies? Check out the most recent newsletter. Bowen Therapy continues to amaze me. I finished my Cert IV a couple of years ago, which gave me a great modality to work with. Earlier this year, I finished the Diploma which gave me more procedures to offer clients. The brilliance of this modality is, in part, the subtleness of it. Clients may think we are not doing much (the moves do tend to be very gentle) but it's the body which is doing the work at its own pace. The moves signal the brain and the brain has the blueprint which allows the body to remember what perfect health is, and move towards it. In October, I did the Specialised Procedures 2 workshop, taught by the amazing couple who brought Bowtech Bowen to the world. These extra moves and procedures offer such a complete healing modality and I feel so blessed to be part of the Bowen family. The additional moves for shoulders are outstanding. As are the moves which help with digestive, lymphatic and hormonal issues. Every Body is better with Bowen! I am now a TLC practitioner! I love this modality. I've got some information on the TLC page, but for a more comprehensive look at why they are so incredible, have a look at the dedicated website. Book a session today and feel what these profound essences can do for you. Appointments available in person or over the phone. While I have tried to make newsletters a regular thing, it has just never happened. But with so much going on at balancing act therapies, I felt it was time to send a newsletter out to clients. Have a read here. In March 2012 I began the Diploma in Specialised Bowen Therapy. It involved more course work, another 100 clinic hours, a research project and 4 face to face modules all spread out over (at least) a year. I am very happy to announce here that as of yesterday (17 March 2013), I have completed all the requirements as well as the 3 days of practical assessments. What a journey! The benefits of this advanced training are many - for me and my clients. I learned new moves, met some awesome people, advanced my own skills and became more and more committed to using and promoting this wonderful modality. For clients, they get a practitioner who is committed to their well-being and the Diploma also allows for a larger pool of health insurance funds offering rebates. Bowtech Bowen is working towards becoming THE alternative choice among many. As more and more people realise the benefit of working towards, and maintaining wellness, a therapy such as Bowen can play a pivotal role in their journey. One of my favourite designs is being used on the front page of a Mothers Symposium website being held in Palo Alto, CA in March 2013. More about it here. Also, five new designs have been added to the sweet&smarte card line, including one ink & watercolour. Peruse or purchase here. I am now offering a card mailing service. Need a card? Make your selection, purchase through the 'mail a card' button, and I will contact you for recipient information, card choice and message for the card. Too easy! the ocean oracle goes electronic! 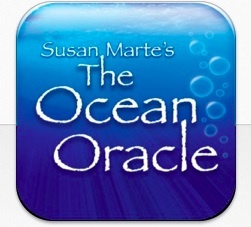 The Ocean Oracle app is now available on the App Store. It's been four years in the creating (the Oracle, not the app!) and now it's available for download at your fingertips. Same beautiful cards, Story and Messages with the added feature of audio and a 45th card. You have the option to listen to the cards being read (by me) for either your single card, 3 card or 5 card spread. You can save your card spreads and you also have the option to email them to others. Hand-crafted card decks are also available. Lisa Weikel, a gifted shaman, author and healer located in the US, is this week offering guidance through her blog 'Ruffled Feathers', on the time between 12.12.12 and the solstice on 21.12.12. Each day she is posting a card for contemplation - all of which she explains quite well on her blog. I was honoured that she chose a card from The Ocean Oracle for contemplation on the second day. Energetically, this time seems full of promise and I have committed to following the process she has offered. For me, it feels good to be writing again and to also feel part of this very important time. In gratitude and love. This 4 week course helps to focus and heal the body, mind and spirit through creativity. In today’s world, multi-tasking is seen as a good thing. We credit ourselves to be able to do many things at once, but this is often to the detriment of our well-being. This class invites you into the sacred space of mono-tasking, where each week we will delve into only one process where you can fully immerse yourself in your creativity and being. Each week will build on the last although each class will be a separate theme. The processes will be guided and the creativity will be all about the journey, and not the destination – in other words, it’s not about creating something ‘good’, but about creating something authentic. And it’s not about output, and getting something done, just for the sake of doing it; but instead going deep within and creating from that calm and peaceful space. In creating from this place, it will anchor you to it so when your life gets busy and stressful on the outside, you will be able to tap into the peace and calm on the inside. That’s the power of mono-tasking! Cost: $150 up front or $50/session. All materials provided. Bookings are essential to cater for space and materials. To book, please contact me here. This hands-on workshop explores creativity and its power to heal & transform. Using different techniques and mediums, participants are guided in a process to create from within, going beyond the need to create something ‘good’, to creating something authentic. Creating from this place allows a deep level of healing to begin. Making art is a fundamental extension of our need to create, and because of this, art making has the potential to increase our internal sense of health and well-being. This introductory workshop is for those interested in exploring how art and the creative process can help to heal, whatever the reasons and circumstances. Come explore this unique personal experience, just for you. Prepare to get your hands dirty as your heart sings! There is nothing quite like the power of creating to help us heal & transform. Cost: $150 All materials provided. RSVP: $50 deposit required at time of booking. To book, please contact me here. Weekly Intuitive Painting Class - Come paint with me! This weekly class offers an opportunity to tap into some process painting and just have a play with colour, shape and form. It’s not about creating something ‘good’ but creating something authentic. Creativity is core to our health and well-being and this class offers a space to create and paint through whatever comes up for you. This will be a slightly guided process, but only to get you started. Cost : $30/session. All materials provided.